Manny Pacquiao comes from Kibawe in the Philippines. I don't know how many of you have travelled there, but Kibawe is a small area nestled in the centre of Mindanao where a population of thirty-five thousand people live. It is an area of beauty with rolling plains, mountain peaks and the Paragupac Cave. Pacquiao's official website is good for current news about the star, but it doesn't go into his past enough for my liking. I thought I'd remedy that by writing a few posts on where our favourite Phillippine welterweight came from and what made him the man he is today. Manny Pacquiao had a tough life as a child, forced into taking on the role as the man of the house at an early age after his mother left his father. He supported his family in part by selling bread and also by fighting people in the neighbourhood for cash. 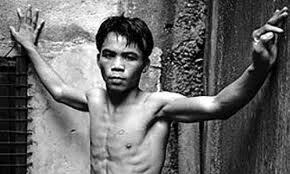 It is well known that as a child the young Manny Pacquai was something of a hustler, a life he would have stayed in had he not become one of the best boxers in the world and made millions from it. These were the early seeds of both the work ethic and love of fighting that would later make the man a boxing superstar. As you can imagine of a child who lived in poverty and didn't know where each meal was coming from, Pacquiao wasn't as athletic as a youngster as he is today. Even so, I'm sure you will join me in feeling sorry for the person who thought they'd make an easy buck by fighting Pacman. "No money to buy food, hungry. I'll always remember my past. When I was young, I had no one to help." Poverty indeed was well known to the young Pacquiao. Not only was he selling bread and fighting to keep the family alive, he would also have to resort to whatever odds and ends could be found to do in Kibawe to make ends meet. This could mean anything from the afore mentioned fighting to selling cigarettes. He has said on many a occasion: "I came from a poor family" and "I know what family is". This is the real past of Manny Pacquiao - a man who came from the most humble roots where poverty was the norm. By the time he was fourteen he became sick of living a lifestyle that only barely supported the needs of his family, so Manny left Kibawe and moved to Manila. There he put his old neighbourhood fighting skills into use and started boxing. Obviously his natural talent shone through and he soon found himself on the Philippine boxing team. Manny Pacquiao has always taken a pride in where he has come from, even going as far as to become involved in the politics of the county. He has often talked about how he would like to give something back to his homeland, and it is common to hear Pacman say things like "I want to be a champion of public service'. It is this refusal to let a dark past slip away and instead shining a spotlight on it in the hope that conditions can be improved that makes Manny such a hero in the Philippines. He is a symbol of hope. Did you like this? Do us a favour and share it with your friends using the buttons below. Thanks.